Roither presented on creating a flipped classroom at the TESOL international convention in Baltimore. Judy Geczi, Instruction and Liaison Services librarian, was a keynote speaker for Lovejoy Library’s Spring Symposium 2016 at Southern Illinois University – Edwardsville. She presented on "Assessment in Libraries" with Carol Mollman of Washington University in St. Louis. The symposium, "Assessment in Libraries: Measuring Impact, Planning for Success” feature librarians with academic and library system perspectives sharing their library assessment knowledge and experiences. Amy Roither, associate adjunct professor of ESL in the International Languages and Cultures department of the College of Arts & Sciences, presented at the April 4 Teachers of English to Speakers of Other Languages (TESOL) International Convention and English Language Expo in Baltimore, Maryland. Roither's workshop, “Building Content: Resources for Creating a Flipped Classroom,” focused on three ways to build content in flipped lessons using readily available and free technological platforms: Rich Internet Applications, Spreaker Studio, and Google Forms. Her workshop drew an audience that engaged in discussion, scaffolded hands-on activities and reflection. The nearly two-hour workshop was the culmination of several shorter presentations that Roither has given in the past two years. 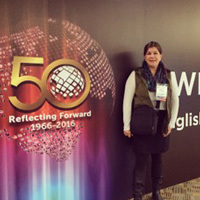 On Oct. 24, she presented “Rich Internet Applications for University ESL Courses” at MIDTESOL in Iowa City, Iowa. Roither is a member of both TESOL and MIDTESOL. Neal (far right) represented Webster as judge for the competition. 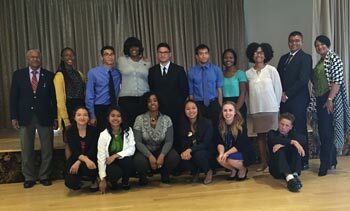 Twelve participants represented various military installations across California, during the week-long event. Judging included an interview and speech and culminated with dinner, for sponsors and family members. The winner advanced to the regional and national competition. The national competition will be held in Washington, D.C. and will include a visit with President Barack Obama. This is the second year Webster has participated. Gladys Smith, assistant director, Counseling and Life Development Office, spoke at two events to raise awareness on the impact of trauma in our community. On April 6 she presented at St. Louis University as a part of their ATLAS week: Reaching Across Borders. The topic was America's War Zones: Understanding the Effects of PTSD in inner City America. On April 9 she presented to Northwest Academy of Law for the sorority AKA in their mental health awareness campaign, serving on the panel, "Trauma: Invisible Wounds Impacting Academic Achievement." Literary Hub, a collaborative blog of major and mid-sized publishers, literary journals and bookstores, cited Joe Schuster's novel The Might Have Been as one of 10 notable contemporary baseball books. Schuster is a professor in the Department of Communications and Journalism in Webster's School of Communications. The article said, in part, "Like any sports novel worth its salt, The Might Have Been is about regret, limitations, and our infinite, absurd capacity for hope."